After only 2 1/2 weeks of rehearsals we officially opened the stage production of 'ONLY DRUNKS AND CHILDREN TELL THE TRUTH' at Magnus Theatre way up in northern Ontario in Thunder Bay. Playwright Drew Hayden Taylor was also in the audience for last night's Opening Night performance. A special chi-miigwetch to Drew for making the journey up to Thunder Bay to see the show! The media also came to visit us a few days ago during our previews which included APTN National News and TBT Thunder Bay local news. They each broadcast a segment on the show and interviewed the director Thom Currie along with the cast which includes Samantha Brown, Julie Lumsden, Dillan Chiblow and myself. I've shared each of the video news segment links below where you can get a special sneak peak of the show. Enjoy the segments and feel free to share with anyone on social media you know who might be interested in hearing more about this stage current production. FYI: The first video, TBT local news segment, begins at the 12:45 minute mark. The second video, APTN National News segment, begins immediately after pressing play. For the month of July I will be participating as an actor in Daniel David Moses's adaptation of the late Basil Johnston's book/memoir 'Crazy Dave'. The play adaptation is titled 'Crazy Dave Goes To Town' and will be directed by Colin Taylor. The actors performing in the play will be myself, Michelle Thrush, Cathy Elliott, Brandon Oakes and Garrett Smith. The play hits home a very personal level because of the simple fact that the entire story centers on the actual First Nation community and people in which I grew up, Neyaashiinigmiing (formerly known as Cape Croker Reserve). My grandmother Kay personally knew of the man many people on the rez used to call "Crazy Dave" and has her own personal connection through stories of her own about him. Many of the actual events written in Basil's book which transpired in my community of Neyaashiinigmiing, including in the small town of Wiarton located 30 minutes away from the rez, will be featured in the play. That being said, I am quite excited to delve into this 4-week workshop and bring life to the many colourful characters in the story that are based on actual people from my community, a few whom I actually knew! A public staged reading will be performed on Sunday, July 30th at the Aki Studio Theatre in the Artscape Daniels Spectrum Building located in downtown Toronto in the heart of Regent Park. Mark the performance date down in your calendars!! It's a 1 night only event. Later in 2018, the play will be fully produced as part of Native Earth Performing Arts 2017/18 season. 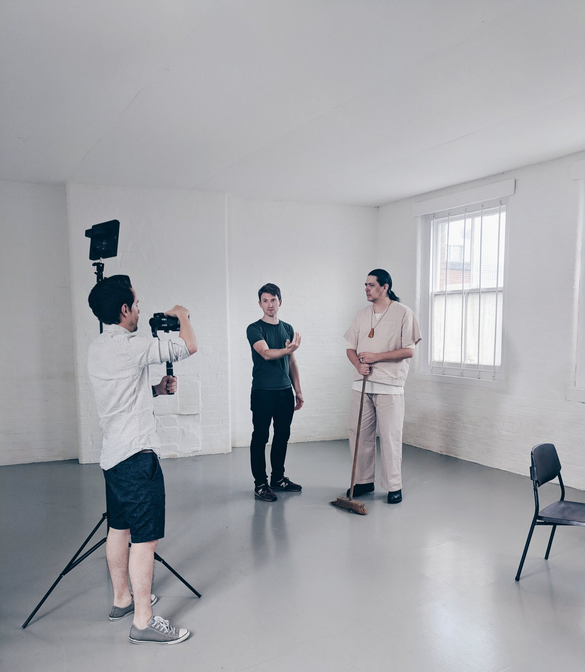 I encourage you to continue visiting this blog section of my website for further developments including my experience in rehearsals as well as the progress of bringing this funny play to life onstage with a very talented group of artists and storytellers! Won't you come along on this creative journey with me? I have officially begun the final week for the stage production of OF MICE AND MEN with the Maples Repertory Theatre here in Missouri. It's been a rewarding and challenging 5 weeks. The adjustment of being away from friends and family back home, working in a peculiar small town in the middle of America and the many performances that I already have under my belt with performing in this show has allowed me to reflect on this wonderful and bizarre experience of making live theatre and telling stories. I use the metaphor of jumping on a freight train or running a marathon to best describe was it feels like to perform an entire show like this one for a live audience. As an actor I need to be ready to jump on the train otherwise I will be left in the dust. The amount of focus, commitment and energy, both physically and emotionally, it takes to perform as Lennie Small for every show can be exhausting. There are some days where I don't know if I'll even have the energy to get through a show because of the demands it places on me as an actor. But somehow once I jump on that train I am magically carried along for the journey and come out the other side feeling both exhausted and elated for having shared the experience with a live audience. That being said the audiences have been varied and small but the doesn't mean that I perform each show with same amount of dedication and energy as the rest of them. Having been performing the show for the past few weeks I feel as through I am now building back my stamina as a performer, which is a muscle you can only build from doing theatre regularly. Some of the shows are now getting a little easier to do where I don't feel so drained and exhausted after I take my final bow. That being said, I am still entering my final week of performances and it'll be a sad time to release and let go of the character of Lennie Small. I have undoubtedly grown very attached to the character and his emotional journey. I have also grown so much as an actor in playing him onstage. The gift of being able to stretch my muscles and expand my craft as a storyteller has been, and continues to be, an amazing and extraordinary experience. Chi-Miigwetch/Thank you very much to all those theatre patrons who have made time in their busy lives to come see and experience OF MICE AND MEN onstage at the Royal Theatre. I truly believe I am doing some of the best work of my career with this show and regardless of how many people see it I know in my heart that I will be leaving this show with a great amount of gratitude and joy from having been given the opportunity to be part of such an amazing story and production. Sadly, I've been neglecting this blog for a while now. It's now been almost 4 weeks since I first arrived in Macon, Missouri earlier in June to begin the journey with OF MICE AND MEN. The rehearsals definitely putting me through the wringer, both physically and emotionally. I really don't do anything half-assed. I totally commit to the storytelling and bringing life to a character. Lennie Small was no exception. From day one I worked with the text and then began to create him through physical gestures and posture, voice and then deep child-like emotional core and spirit. Once I discovered who Lennie Small actually was to those around him then the play really started to reveal itself to me. It was a powerful yet emotionally exhausting experience. Ontop of everything else with daily rehearsals inside an old, hot and muggy rehearsal hall I was doing graduate research for my Masters Degree and working hard at getting my lines memorized. It's astonishing that we created this show with technically only 10 days of rehearsals. Pretty amazing if you ask me. The show officially opened this past Friday here in Macon, Missouri and it was pretty well-received by the local theatre-goers and community. My only concern and hope is that people don't shy away from the play because of its heavy subject matter. We definitely need more butts in the seats and hopefully a strong word-of-mouth will spread about the show. OF MICE AND MEN is not a musical so it asks something totally different from its audience. The play asks you to think deeply about issues concerning your own life, friendships, community, poverty, the dream, the hope, etc. With musicals it can often times be so easy for audiences to escape within the feel-good and uplifting music. I have nothing against musicals, they are just something totally different from a classic dramatic play like OF MICE AND MEN. Audience members have been very warm and receptive to the show, some even contacting me directly via my website to express how much the show has meant to them. I am deeply humbled and honored by the feedback and comments. OF MICE AND MEN runs until July 17th at the Royal Theatre in Macon, Missouri. Help spread the word and come back to see the show again if you so please. We'd really like to get more people in the seats. Miigwetch/Thank you! 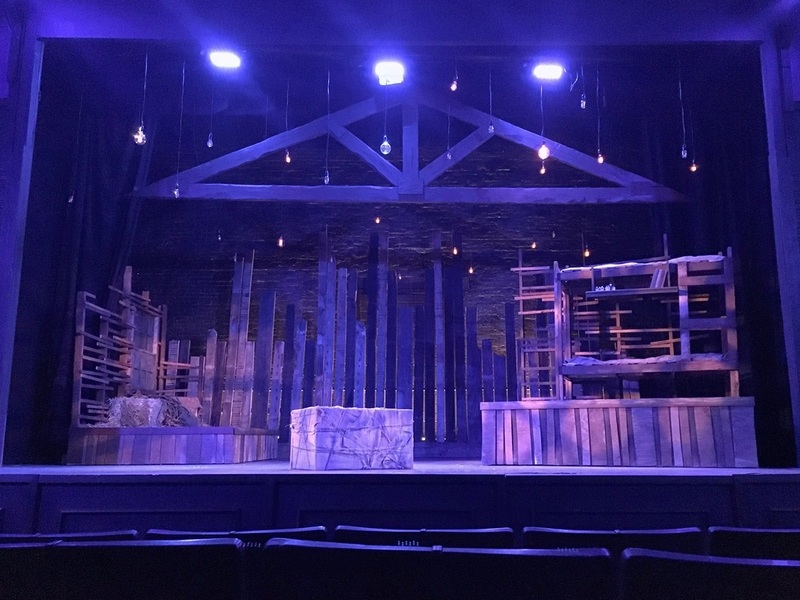 Pictured Above: The set design for OF MICE AND MEN with the Maples Repertory Theatre. 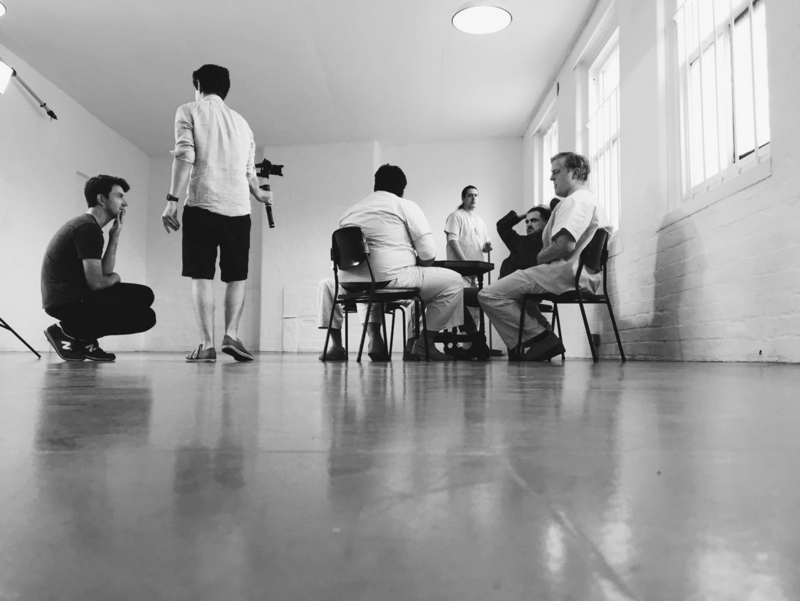 When I traveled to Bloomington, Indiana this past January to rehearse and perform in the stage production of ONE FLEW OVER THE CUCKOO'S NEST with the Cardinal Stage Company who knew what an amazing impact I would be making on students, especially a young First Nation girl's life. I have always said that if I can touch at least one young person through my work and storytelling then my job is done. One student in particular, a local First Nation student named Ana Stahlman, attended a special school matinee performance of ONE FLEW OVER THE CUCKOO'S NEST with her high school class and was so moved by the show that it inspired her to start dreaming about the possibilities of pursuing a performing arts career. Having grown up on the reservation for most of her life Ana expressed that opportunities like this to see live theatre were very rare. 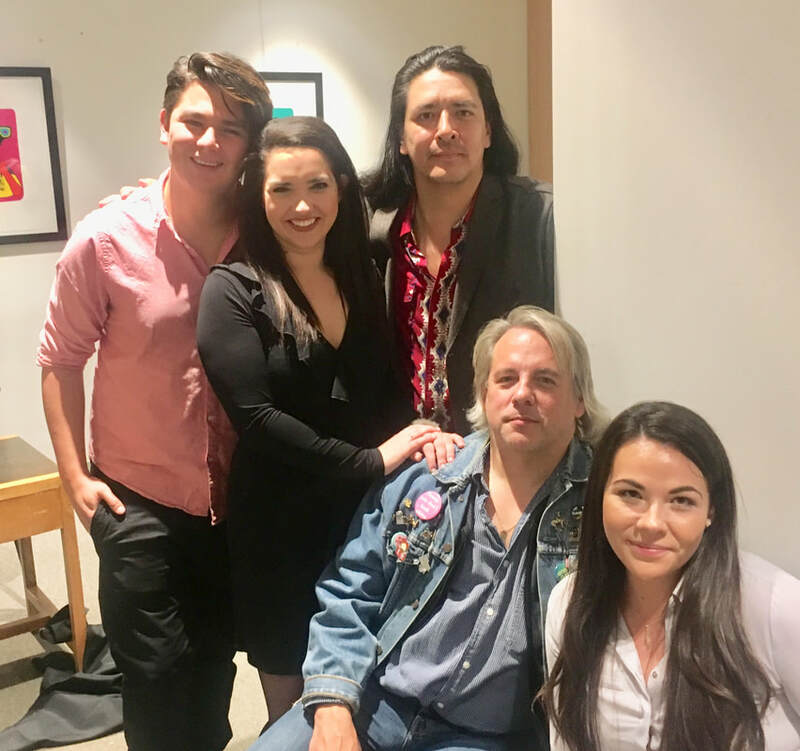 Up until she saw this particular stage production she personally shared with the Cardinal Stage Company that she had never before seen a First Nation actor perform onstage and was deeply moved by the whole experience. Seeing ourselves reflected onstage through various characters can be such a powerful experience, especially for our First Nation youth who need the positive reinforcement of having role models in their lives. It's amazing when you hear about defining moments like Ana Stahlman's, especially when you know you've played a pivotal part in it. I am humbled and grateful to know that I made a lasting impact in her life and hopefully inspired her to purse theatre. Be sure to watch the special video below that was produced by the Cardinal Stage Company about the powerful impact that their special 'Cardinal for Kids' initiative has had on the lives of children, youth and families who are able to experience the many amazing theatre productions they produce each year in Bloominton, Indiana. Theatre arts definitely has the power to change lives! Miigwetch to the Cardinal Stage Company for continuing to inspire our youth and future storytellers! Currently, I am in the beginning of rehearsals with the new play BENT BOY at the Centre for Indigenous Theatre (CIT) in Toronto. The students at CIT have been very keen and enthusiastic in the rehearsal room. I get such enjoyment from working and watching our younger First Nation storytellers go through the process of creating live theatre onstage. This whole experience has been consistantly reminding me of the fact that I too was once where they are as students many moons ago. During this first week of rehearsals we have been roughly tracking and blocking our way through the entire play. It can be a tedious process. Character development will eventually grow stronger for each of the students as they begin delving further into their roles. That being said all the other production elements such as lighting, sound, set and costume design are still being discussed with the director and will all play a vital role in bringing the story of BENT BOY to life on the stage this May. 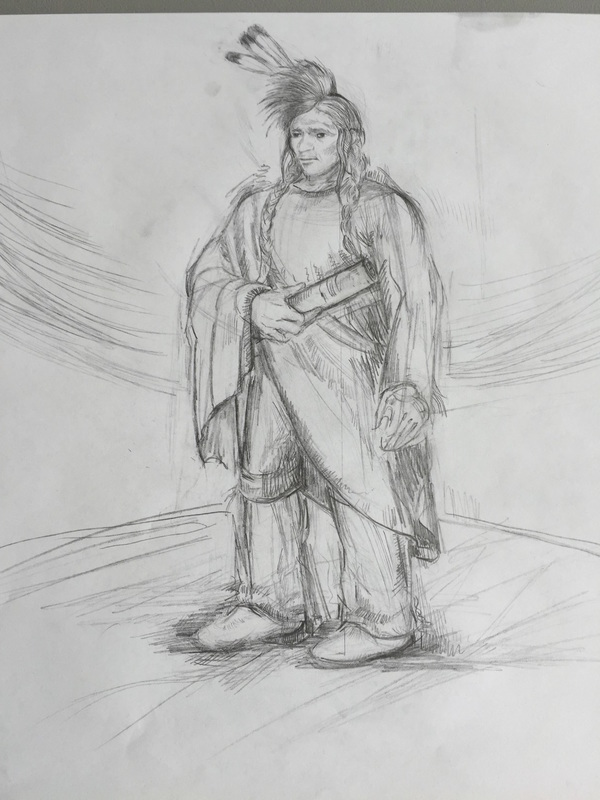 Below is a preliminary costume design sketch for the character of 'Eagleseye', just one of a few characters I will be portraying throughout the course of the play. Because the play was written for a younger audience, actors will be taking on the huge task of playing multiple characters such as animals, villagers, landscape such as stones and trees and even the elements such wind and water, all cleverly staged and dramatized through shadow play, puppetry, movement and dance. BENT BOY is truly an ensemble piece and I know audiences, especially children, will be so amused and entertained by the moral message of the story as well as the many different characters featured throughout. Pictured Above: Costume design for the character of 'Eagleseye' in the CIT production of BENT BOY. Photo used with the permission of Gabby Caruso for Red Pepper Spectacle Arts. Feature Film "Songs My Brothers Taught Me"
I have been following the development of the film SONGS MY BROTHERS TAUGHT ME for quite a while now. I can recall many years ago when I first heard it was being developed through the assistance of the filmmakers lab at the Sundance Institute. Now the film has finally been made and being released! As a First Nation filmmaker, actor, storyteller and avid film-goer I am always seeking out films that honestly depict and speak to the experience of being a First Nation person in today's contemporary world. So many films throughout the history of filmmaking have failed to represent our stories in a respectful and powerful way and only perpetuate harmful stereotypes and cliches about what it means to be Indigenous and First Nation on Turtle Island. SONGS MY BROTHERS TAUGHT ME, written and directed by Chloe Zhao, looks promising in breaking the mold by presenting an achingly honest reality about the trauma that native peoples, families and communities deal with, about reconciliation and how First Nations Peoples have been directly affected by colonization, assimilation and genocide. Be sure to watch the trailer below and visit the film website at http://songsthemovie.com/ to find out where you can watch the film in a city near you. Currently, the film is playing in limited release and select cities in the USA but hopefully with enough interest it will expand to more theatres in more cities across Turtle Island. Returning to the Centre for Indigenous Theatre (CIT) After Nearly 20 Years!! This May I will be performing with the 3rd students at the Centre for Indigenous Theatre (CIT) in their year-end production of BENT BOY written by Herbie Barnes and directed by Ed Roy. The show will be performed at the Aki Studio Theatre in the Artscape Daniels Spectrum building located in the heart of Regent Park in Toronto. This is a kind of a full circle moment for me in a very funny and moving way. Back in 1998 I was one of the very first students to attend and graduate from the Centre for Indigenous Theatre's full-time conservatory program. At that time CIT was the first and only professional First Nations and Indigenous theatre training program/school of its kind in North America. I was such a newbie to Toronto back then and it was a huge culture shock to move to the city in order to study theatre full-time. But I was very honored to be part of the first foundation year and class of students. Flash-forward nearly 18 years later and I'm now back at CIT performing as a professional actor with our future storytellers and performers in the theatre community who will be newly embarking on their performing arts careers just like a did nearly two decades ago. What a gift to be sharing this moment with these students. Show dates and times as well as details on how to purchase tickets for BENT BOY will be posted soon so continue staying tuned to this blog and the main page of my website for more announcements as they unfold. Below is a brief synopsis of the play. Bent Boy is a Theatre for Young Audiences play about two youths, one healthy and popular, the other bent and usually in the way. The two are sent from their village to recover a treasure that will insure the future of their community. Together they must overcome obstacles and learn valuable lessons along their way. Some more exciting news! I've received another honor this year, this time in the field of education, leadership and career achievement. I will be receiving the 2016 Graduate Hall of Fame Award from my secondary school (Class of '98), Peninsula Shores District School (formerly known as Wiarton District High School). I'm thrilled to have been invited to address the graduating class at the 2016 commencement ceremony later this year in June. I am deeply honored by the recognition from the community and would like to say chi-miigwetch/thank you very much to those members and storytellers of my First Nation community all across Turtle Island who have always helped to encourage and support my artistic endeavors as well as the commencement committee at Peninsula Shores District School for nominating me for this year's honor. I hope to continue inspiring our future leaders of tomorrow by reminding them of their true potential and unique gifts to help make the world and their communities a more kinder, accepting and loving place to live by remembering to continue to honor and celebrate their unique differences as human beings and caretakers of Mother Earth.